Amazing! And we think Trump is not draining the swamp? wow. It is head spinning! The criminals are sinking themselves due to their arrogance. You punks are done. The people see you! YOU WILL NOT TOUCH TRUMP BECAUSE HE WAS ELECTED BY AWAKE AMERICANS. YOU CAN TAKE YOUR RUSSIAGATE CRAP AND STUFF IT. THE AMERICAN PEOPLE WILL NO LONGER ALLOW ARROGANT LITTLE BOY THUGS TO RUN THEIR COUNTRY. GET READY! YOU WHO THINK YOU ARE UNTOUCHABLES ARE GOING DOWN. JUSTICE WILL BE SERVED THIS TIME! GET READY! MERRY CHRISTMAS, AMERICA! IF YOU CONTINUE STANDING WITH TRUMP THESE TREASONOUS BASTARDS WILL BE GONE AND YOU WILL GET YOUR COUNTRY BACK! Mueller just exposed himself and destroyed his career. He is probably wishing right now he never took the job. FINALLY JUSTICE IS BEING SERVED ON THE TRAITORS OF THE REPUBLIC! Trump gave these arrogant lowlifes the rope to hang themselves, and they are doing just that in their total arrogance. Now how stupid is that? The â€œcampaign data operationsâ€� are said to be what Mueller is not interested in. In yet another hint at Trumpâ€™s honesty, the firm complied with the request without question. These emails have already been given the House Intelligence Committee, so the information that they hold isnâ€™t in question. By contrast, let us remember how much obfuscation still exists regarding hard drives that have been requested for various investigations into the DNC and other Wiley Democrats. Army Ranger Kris â€˜Tantoâ€™ Paronto was one of the heroes who lived through the hell of the Benghazi attack and he set corrupt criminal Eric Holder straight. McCabeâ€™s retirement announcement comes on the heels of a major shake up at the FBI; Wray just removed Comey â€œconfidantâ€� and suspected leaker James Baker from his top post as general counsel. Andrew McCabe, the FBIâ€™s deputy director who has been the target of Republican critics for more than a year, plans to retire in a few months when he becomes fully eligible for pension benefits, according to people familiar with the matter. WHY SHOULD HE GET A FULL PENSION IF HE SOLD OUT? DISGUSTING! ALL OF THESE SELLOUTS MUST BE HELD ACCOUNTABLE AND THEIR PENSIONS TAKEN AWAY. NOTHING ELSE IS REAL PUNISHMENT. Remember what happened when Ben Swann exposed the pedophiles? THE LIE IS CRUMBLING! THE DEEP STATE LITTLE BOYS ARE VERY SCARED! FULLY EXPOSED! GOING TO JAIL, ONE BY ONE! Mueller best get on the right side of the law, or he will go down with all his deep state buddies. The House Intelligence Committee on Thursday released a 165-page transcript of testimony given on Nov. 14 by Fusion GPS founder Glenn Simpson. The transcript was released after a unanimous vote by the committee earlier in the day. Thursday on the Fox Business Network, Rep. Matt Gaetz (R-FL) teased an intelligence memo that he claimed went â€œto the very foundations of democracyâ€� and called on his colleagues in the House of Representatives to make the memo public. Gaetz told host Liz Claman the memo involved the FBI, the Department of Justice and President Donald Trump. 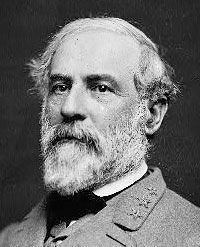 Hannity just had the congressmen on and it may be the most explosive story since this all started; not only did they try to stop Trump from winning they are trying to overture the elect in a fiat coup and as far as I see that is treason to try overthrow the US government, treason plane and simple. There is a need to have people *(in high places) tried and put in prison if not capital punishment, to cause people to consider this is no game and the consequences need to be very serious. Members of the House on Thursday said they viewed a â€œshockingâ€� classified memo allegedly detailing abuse of the Foreign Intelligence Surveillance Act (FISA) by senior Justice Department and Federal Bureau of Investigations officials in relation to the investigation of the Trump campaign and called for it to be declassified and available to the public immediately. â€œThe facts contained in this memo are jaw-dropping and demand full transparency. There is no higher priority than the release of this information to preserve our democracy,â€� said Rep. Matt Gaetz (R-FL), a member of the Judiciary Committee, which oversees the DOJ and the FBI. â€œThe classified report compiled by House Intelligence is deeply troubling and raises serious questions about the upper echelon of the Obama DOJ and Comey FBI as it relates to the so-called collusion investigation,â€� he tweeted. Thursday on Fox News Channelâ€™s â€œHannity,â€� in an appearance with Rep. Jim Jordan (R-OH), Rep. Matt Gaetz (R-FL) followed up on an earlier statement he made regarding a House Intelligence Committee memo he argued should be released to the public. Gaetz described the investigation underway by special counsel Robert Mueller as â€œa lie built on corruptionâ€� and claimed people would â€œgo to jailâ€� over the contents of the memo. "These sources say the report is â€œexplosive,â€� stating they would not be surprised if it leads to the end of Robert Muellerâ€™s Special Counsel investigation into President Trump and his associates." probably the same all over the net. has devoted zero coverage to the â€œworse than Watergateâ€� scandal." This goes back to "What's Ya Going To Do About It?" And if the DOJ & FBI knew about this? Then why haven't these people been arrested, already? And when are the arrest going to be made? Where are these criminals now? The only delay I can think of is that Trump is using the information to apply pressure to get things done that he wants. Also, those implicated can be influenced, with time and pressure to squeal on others. Then, so what -- the hammer falls anyway. That can make some sense; but it looks like there may not be to much more to squeal on each other: They never thought it would come to this and never spent much time on covering their tracks. We will see; I though it was some of the biggest new on the year. In looking to the future, what do we do about these Mosque-ridden, no-go zones? It is not ok to transplant and plop down a culture that is incompatible right in the middle of cities all across America. Their sharia law needs to stop, as well. It really is important, if there is a migrant coming to America, they need to go through an immigration process that includes massive education on what our country is about (Judeo-Christian Laws & history of our founding & Constitution) and to learn English. They need to recognize, appreciate and be grateful to Americans and America for even being here. This can be taught. They need to be taught the scientific results of in-breeding and possibly agree to tube tying and vasectomies. Believe me, they need to learn about our toilets and plumbing too. At this point, if they do not like it, give them a one-way ticket to wherever they want to go, out of this country. The people deserve to know the truth. Many of us already know about the criminal deep state crimes against the people. Show us all the info. Then start prosecuting these deep state criminals, and their treasonous minions who pretend to represent the people whil working for these criminals. We see many of the minions now leaving Congress. They know the gig is up. Imo, every congressman should be forced to give up their pensions for allowing the country to be taken over by the psycho globalists. You did not do your job, and have grossly failed the people. Many of the rest of you need to be fired from Congress. No more chances! ON YOUR WATCH, THE COUNTRY WAS TAKEN OVER BY THE GLOBALISTS MANY DECADES AGO. ALMOST EVERY CONGRESSMAN, WITH VERY FEW EXCEPTIONS, IS GUILTY BY COMMISSION OR OMISSION OF FAILING THE PEOPLE. YOUR CUSHY JOB AND YOUR PAYOFFS FOR GOING ALONG CAME BEFORE YOUR INTEGRITY OR THE PEOPLE. THAT IS SHAMEFUL.! Nothing will shock those of us that are informed. We also know the ones in the media who lie and scream about Trump the most are on the wrong team, and indeed supporting the criminals. They are done. Show us all of the information on these scumbags and now! We can then help you deal with these punk criminals, and support the few good guys who are finally standing up and trying to deal with them. ABOUT TIME! We must know it all before we can take the country back from the maggot criminals. They are losing. We are winning, but the fight is not over until every last scumbag goes to jail for the rest of their pathetic, psycho days. RELEASE IT ALL! PREPARE THE PRISONS! IF YOU ARE A JUDGE AND YOU DO NOT START SENDING THESE PUNKS TO PRISON, YOU WILL BE RUN OUT OF YOUR PROFESSION. FIND YOUR BACKBONE, OR TURN IN YOUR LICENSE AND LEAVE IN DISGRACE! ENOUGH!
" ... revealed manifest bias among top FBI officials against DonaldTrump. The texts between Strzok and Page referenced a â€œsecret society". According to Attorney General Jeff Sessions, 50,000 text messages were exchanged between Peter Strzok and his mistress Lisa Page. These 50,000 text messages do not include the â€˜missingâ€™ texts. 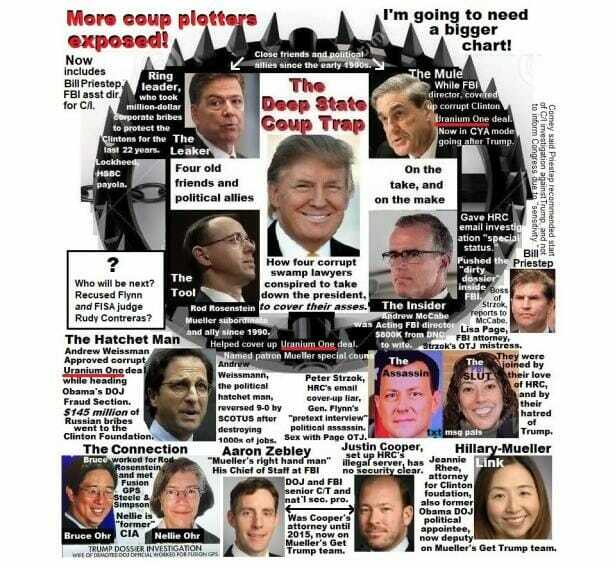 Rep. John Ratcliffe (R-TX) said after reviewing the new text messages he believes there may have been a â€œsecret societyâ€� of folks within the DOJ and FBI working against Trump. "More than 50,000 texts were exchanged between two FBI officials who have come under fire for exchanging anti-Trump messages during the 2016 election, Attorney General Jeff Sessions revealed Monday. The figure surfaced as lawmakers have been pressing for answers after revelations that the FBI â€œfailed to preserveâ€� five months of texts between Peter Strzok and Lisa Page. â€œAfter reviewing the voluminous records on the FBIâ€™s servers, which included over 50,000 texts, the Inspector General discovered the FBIâ€™s system failed to retain text messages for approximately 5 months between December 14, 2017 to May 17, 2017,â€� Sessions said. "There is so much smoke here." 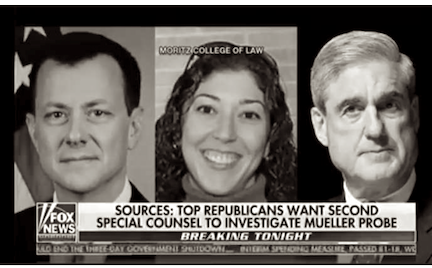 Former FBI officials Peter Strzok, Lisa Page, and Special Counsel Robert Mueller. the FBI was holding secret meetings off-site after the election of Donald Trump. On Special Report with Bret Baier Tuesday evening, Senator Ron Johnson (R-Wisc.) called it "corruption of the highest levels of the FBI." "That secret society â€” we have an informant that's talking about a group that were holding secret meetings off-site," Johnson said. "There is so much smoke here." 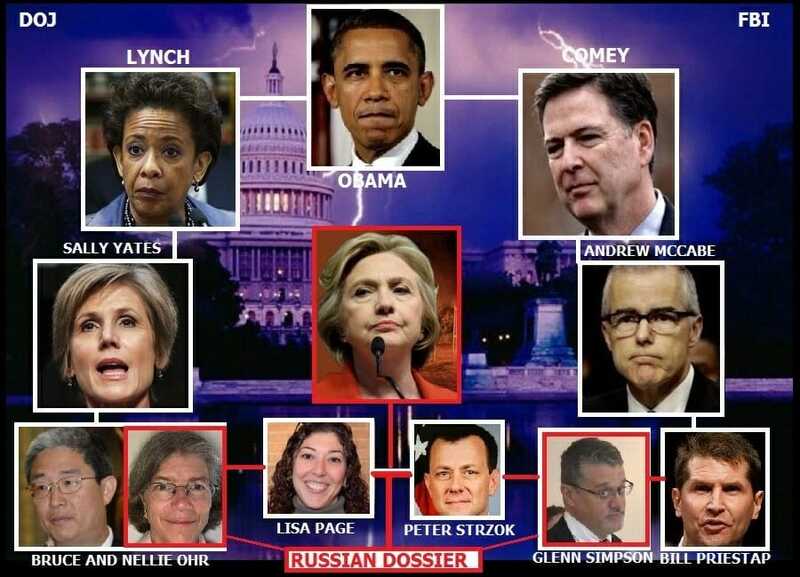 This comes after text messages between FBI counterintelligence agent Peter Strzok and senior FBI lawyer Lisa Page, his paramour, revealed that a "secret society" of officials within the FBI met the day after the election of Donald J. Trump to plot against the president-elect. "A secret society?" Baier asked. "Secret meetings off-site of the Justice Department? And you have an informant saying that?" "Is [there] anything more about that?" Baier asked. "No. We have to dig into it -- this is not a distraction. Again, this is bias -- potentially corruption -- at the highest levelsee of the FBI," Johnson declared. Mueller keeps digging his hole, like all the rest. Jail time coming for all of them! ... WHO ARE THESE CLOWNS KIDDING? Mr. Trump / Mr. Sessions ... ARREST THEM! Unnamed federal law enforcement officials told Fox News that â€œthousandsâ€� of FBI cellphones were affected by the technical glitch that led to the failure to capture five months of texts between FBI officials Peter Strzok and Lisa Page. The officials told Fox News that the glitch affected nearly ten percent of the FBIâ€™s 35,000 employees. Attorney General Jeff Sessions said in a statement earlier this week that a review is already underway into what happened, and to see if the messages can be recovered. Senior Justice Department officials told Fox News that they are â€œtaking stepsâ€� to possibly recover the text messages from the appropriate cellphone carriers, and are making every effort to track down the physical cellphones for examination. The DOJ informed Congress of the missing text messages on Friday, when it released the latest batch of text messages between Strzok and Page to lawmakers. The five-month gap covers the period of President Trumpâ€™s investigation, former FBI Director James Comeyâ€™s briefing of the dossier to Trump, an FBI interview of former National Security Adviser Michael Flynn, the firings of Flynn and Comey, and the standing up of the special counsel. and the FBI the opportunity to review the memorandum ..."
Democrats have been scrambling to try to prevent the memo written by House Intelligence Committee Chairman Devin Nunes alleging FBI abuses of surveillance laws from becoming public. But momentum to release it continues to grow. And now some of the reason that some may not want it out there has been revealed. Ranking Democratic member on the Committee, Rep. Adam Schiff (D-CA) has been the lead Democratic voice arguing against releasing it, said that its release would be divisive and people wouldnâ€™t understand it. That, of course, is pretty insulting to Americans. Basically, Congress shouldnâ€™t be transparent because Americans are dumb. FBI Deputy Director Andrew McCabe, Deputy Attorney General Rod Rosenstein and former FBI Director James Comey are specifically named in the Republican memo that claims the FBI improperly used its power under FISA, the Foreign Intelligence Surveillance Act, to spy on President Trumpâ€™s campaign, the Daily Beast reported. And Rosenstein and McCabe are still there, critical figures in the Russia probe and other investigations. This may explain why there was some speculation that President Donald Trump might be considering firing McCabe.